It's been about three weeks since I last picked up a paint brush but I finally managed to get out this afternoon. It was a beautiful summer's day with temperatures in the mid-to-high twenties. 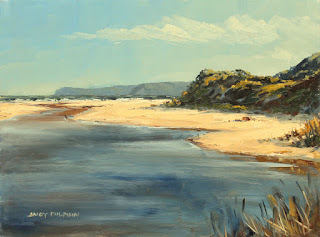 I headed out to Torbay Inlet, near Albany, to see what was on offer for painting. I've only been here once before and knew I'd have to come back one day. Today was that day. I'm a bit rusty after the break but here's where things ended up. I was standing in a great spot by the inlet, looking out toward the ocean. There were pelicans and seagulls, jumping fish and I even spotted a bandicoot. 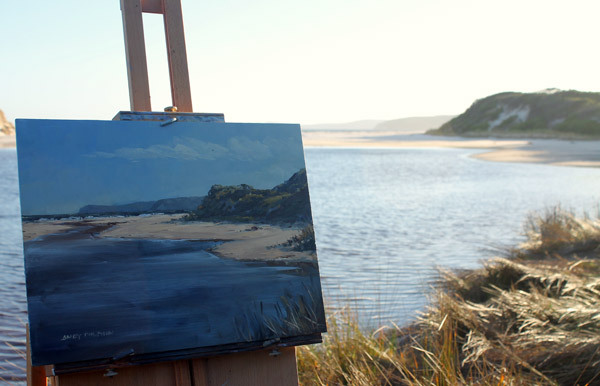 The breeze was straight off the sea but it was pleasant – once I weighed my easel down to stop it blowing over. The water in the inlet is a rich tannin colour but the breeze was disturbing the water surface so there was a lot of reflected light from it. 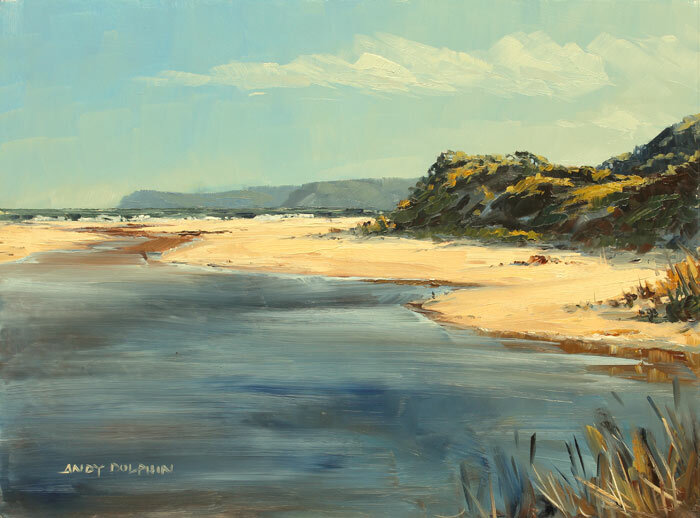 It's a real challenge to try and mix paint for it because some parts of the large expanse of near water seem to be a strong dark blue, other areas a rich red and then, when the breeze blows, other bits are almost sky blue. My main aim was to isolate that bright sunlit strip of sand that snakes across the scene, so I had to keep the water on the dark side. I'll take another look at that large expanse of foreground water one day.